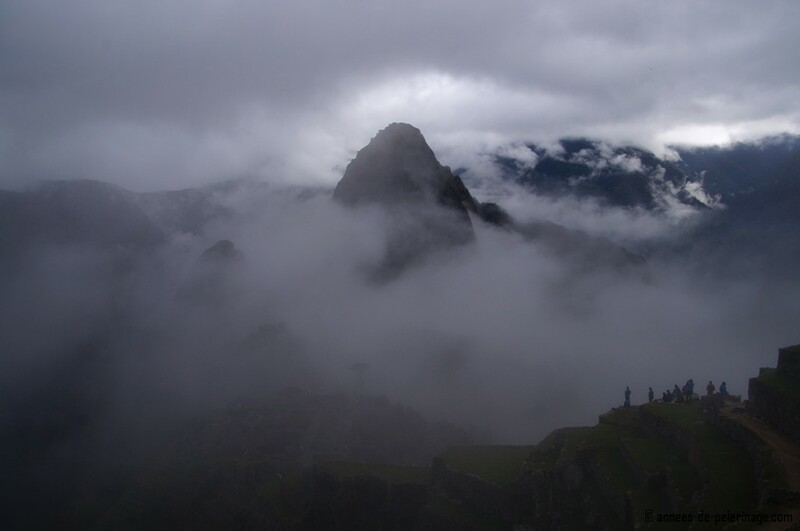 Machu Picchu’s other side: Rain, fog, mosquitoes and big crowds can turn the adventure of a lifetime in a very bad experience just as quickly. You probably have to be deaf, blind and without internet access to not have heard about Machu Picchu, and even then chances are slim. The ancient Inca ruins are voted among the 7 New World Wonders, they are protected by the UNESCO and almost a million visitors pave their way down into the Peruvian hinterland each year. They all come searching for a dream famous Hiram Bingham claimed for himself in 1911. Picture-perfect images of Machu Picchu flooding the social media serve as a marketing perpetuum mobile, enticing ever new generations of photographers hunting for their holy grail in HDR. 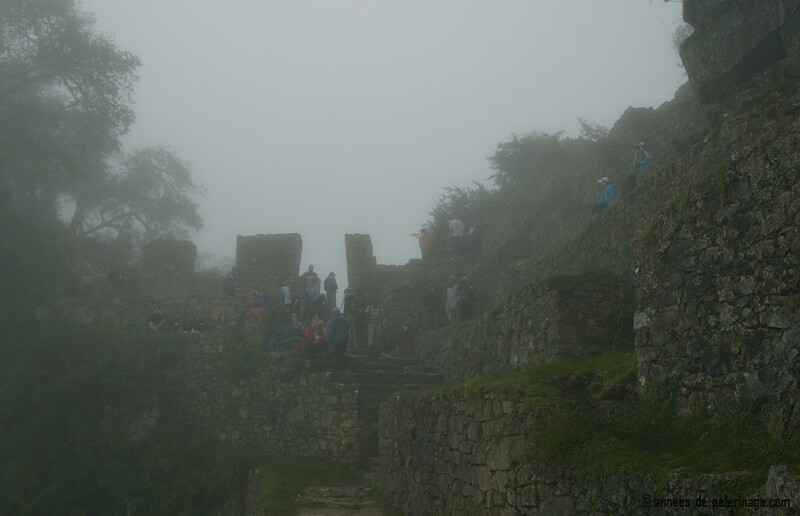 But Machu Picchu also has a dark side, a very rainy, foggy and crowded side, which is crawling with mosquitoes! A side that puts quite a high demand on your packing list (so make sure to read my ultimate Machu Picchu packing list). A word of warning in advance: I’m writing this mainly not to discourage you from going (because you really should! ), but more to show you a less than perfect image. In an age where a beautiful picture means more likes & shares, the somewhat more mundane (or even ugly) reality seldom has a chance to surface. I guess I really can’t exclude myself. I did compile a complete guide to Machu Picchu with copious amounts of those picture perfect vistas. But since people are dedicating a lot of money and funds to visit such a far-flung destination as Machu Picchu, I really felt obliged to keep things real for you. I’ll start out assuming that you are currently planning a visit to Machu Picchu or at least having it close to the top of your bucket list. Much like I did before my first visit, you probably have been googling something along the line: “When is the best time to visit Machu Picchu?”. You probably did your research and came up with May. While June to September is the dry season, May really doesn’t see a lot of rain either but has less of a crowd (40 instead of 20 millimeters of rain). Like most travelers, I came from Cusco (click for 20 spectacular things to do in Cusco). 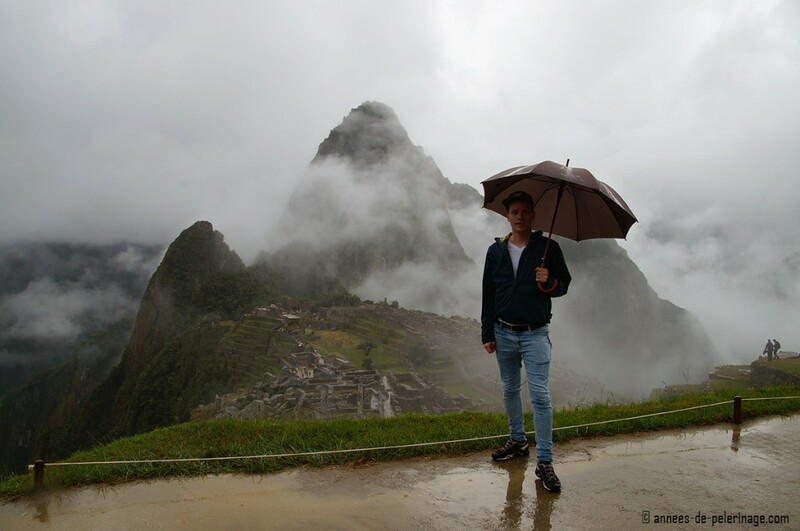 But obviously, even 20 millimeters means that there will be rain in May or June in Machu Picchu. So it pays off to pack wisely (click for a detailed Machu Picchu packing list) Of course, it only results in an average of 2-3 rainy days during that time, as opposed to close to 20 in January. Sometimes the rains are so heavy, that landslide occur! 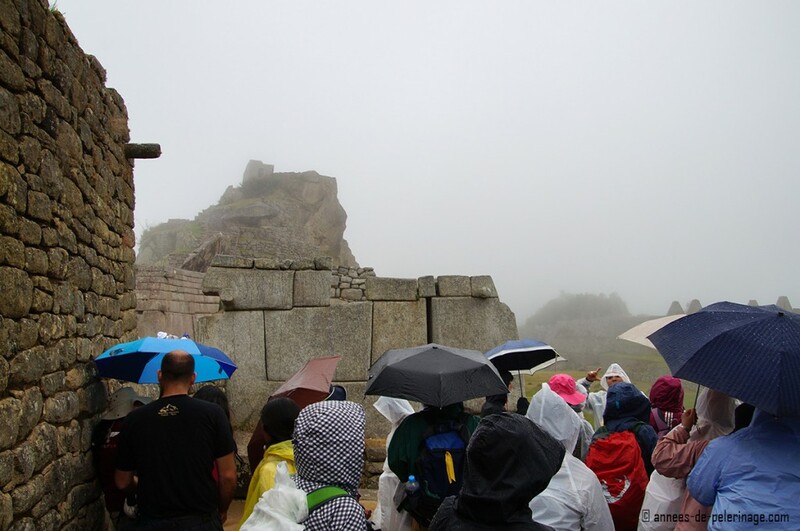 Anyway, if you only got one day in Machu Picchu, there is that chance, that your view on the famous ruins will be somewhat, shall we say, watery – even in June! There is just one positive thing about seeing Machu Picchu in the rain: Underneath the Inca ruins hides a perfect drainage system. 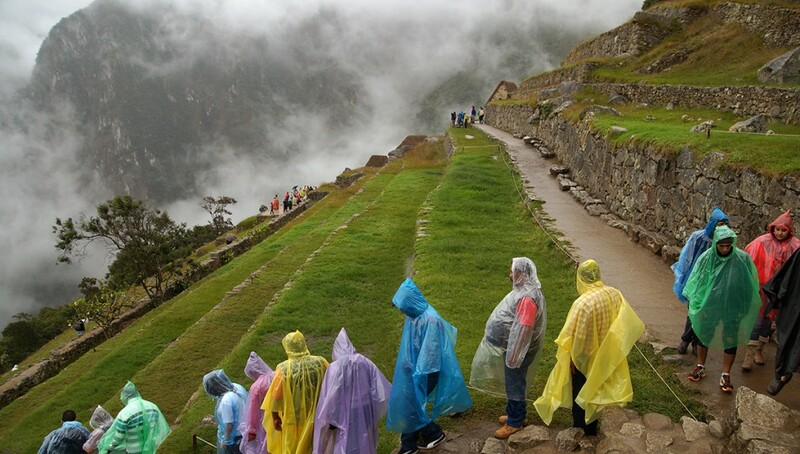 So despite torrential rains, Machu Picchu will not be bogged down in muddy walkways. Heavy rains give you the opportunity to see that ingenious system in action. It kind of reminded me of the famous Inca salt mines in Maras, where the trickling down water is collected in evaporation ponds (wrote about this breathtakingly beautiful Inca site here). Side note: During the dry season it is very rare for the rain to last a full day. Usually, if you wait for a couple of hours, rain and clouds will disappear more or less towards the afternoon. Read more about the weather and the best time to visit Machu Picchu here. Your best picture of Machu Picchu could look like this! (this is the very spot the classic panorama of Machu Picchu usually is taken; view it here in my Peru itinerary). If you take a very close look at a climate diagram of Machu Picchu, you will very soon discover that humidity averages a more or less constant 45 to 65 percent. Machu Picchu is not actually very high, just some ~2.400 meters. It is way better to think of it as a ruin in the middle of a rain forest (all around Machu Picchu you can see orchids, hummingbirds, and even monkeys). 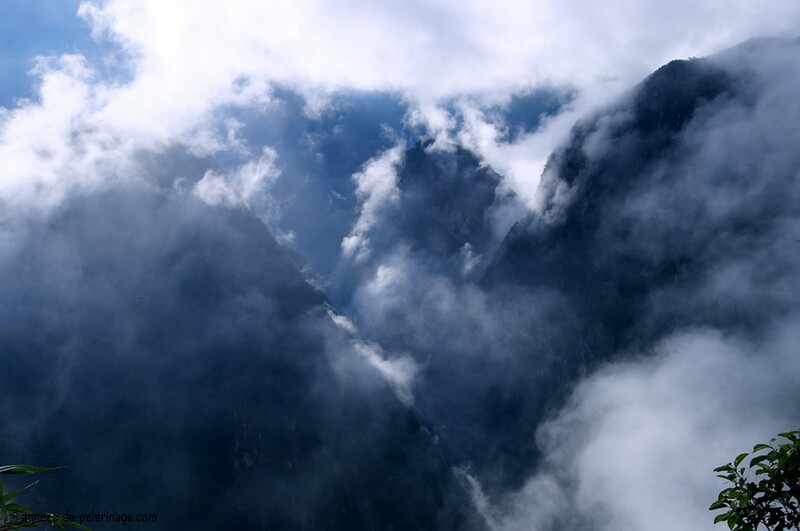 On most pictures of Machu Picchu, you will thus see thick clouds hugging the mountain peaks behind it. But do keep in mind to have your camera ready for when the fog rises because that will be quite a sight to behold!!! I am sure you read that the gates to the sanctuary will open at 6 am. 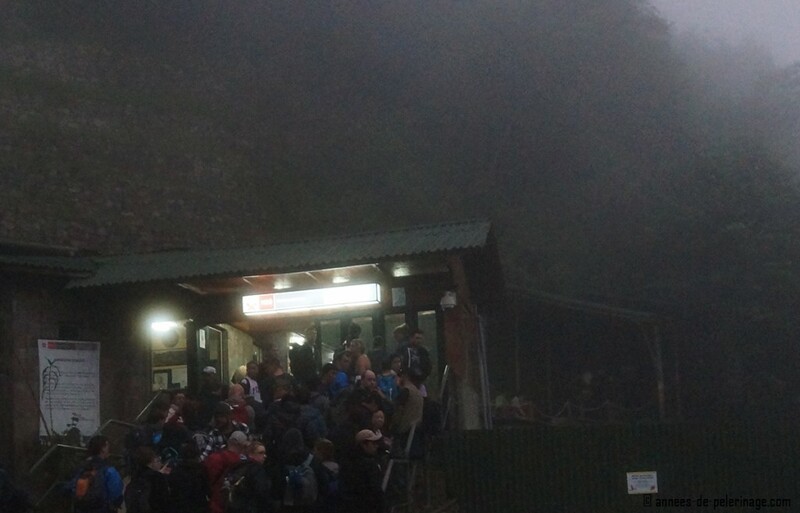 If you want to make it to the gates ready for sunrise in Machu Picchu, you really only have two options: Either you rise up veeeeeerrry early and hike up all the way from Aguas Calientes (the first bus does make it in time, but will mostly already be booked out). Alternatively, you can stay at the Belmond Sanctuary Lodge, the only hotel located inside Machu Picchu (like I did; read about my spectacular stay here), but be prepared for a more than hefty price. The sun rises behind a mountain. By the time the first rays of direct light actually hits Machu Picchu, it will be around 10 am depending on the season. Ever wondered why it took until 1911 to discover Machu Picchu? After all, the Spanish combed through Peru rather intensely – looking for all that Inca gold, and looking for the last vestiges of the resistance. There is one easy answer: Machu Picchu is crouched on top a tremendously steep mountain, much like a crow’s nest. The bus ride will already be quite an adventure and your walk around the ruins will be even more so. There are places where you will be faced with vertical drops of 500 meters and more. People have died trying to climb this mountain! Check out this article to get a feeling for the real danger. This is especially true if you decided to hike the mountain behind Machu Picchu. 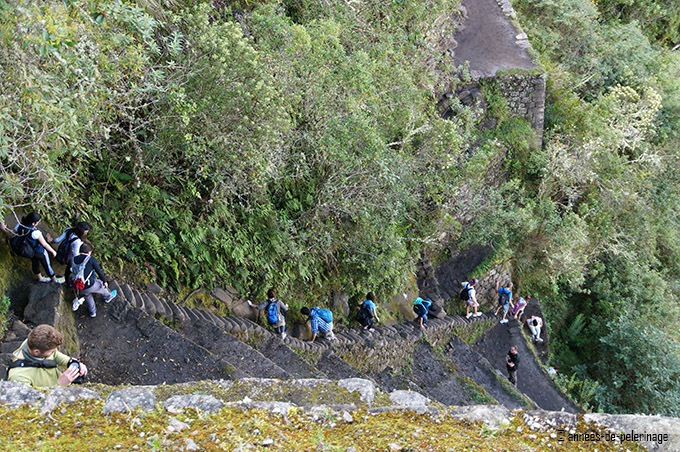 Wayna Picchu is even steeper and is often referred to as the “Stairs of Death” because the climb down features stairs that would better be referred to as ladders. 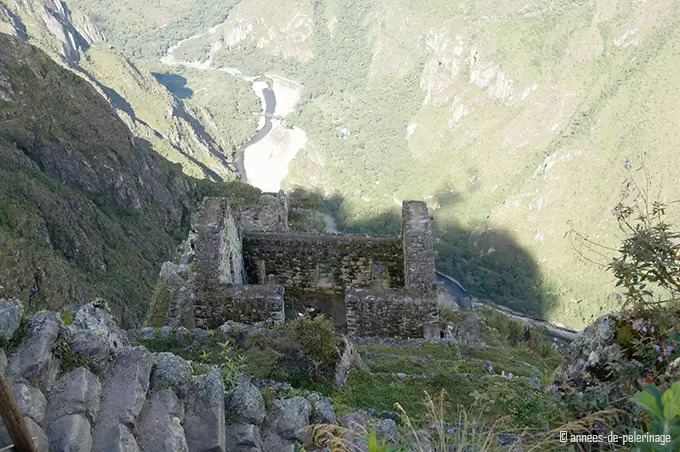 I urge you to read my guide about Wayna Picchu to get a proper impression of just how steep it all is (but also how spectacular the view from atop is). If you are looking for a less scary, but equally spectacular Inca ruins, I am sure you will enjoy Tipon, near Cusco. Read all about the amazing water gardens of the Incas here. The sun gate? Should call it fog gate! Obviously, before my first visit to Machu Picchu, I also looked up “When does the sun rise in Macchu Picchu” and stuff like “Watching the sun rise from the Sun Gate”. So each day in the morning you will find a crowd gathering at the auspicious point waiting for those first rays. For people taking the Inca Trail it will be the first sight of Machu Picchu and usually, these guys wake up around 4 am in the morning to make it in time. But again: you can be lucky to see those first lovely rays, but mostly the gate will be hidden in the fog! Everyone will be in what I call “Selfie Zombie Syndrom”. It’s not a normal crowd, but a crowd constantly hunting that perfect picture for Facebook, Instagram, etc. So especially around noon, the ruins will be very, very crowded. So please do not expect to be alone in Machu Picchu. I found the best time to enjoy in Machu Picchu the late afternoon. It is also the best time of the day for taking pictures (lots of indirect soft light and no sun glare!). I want to repeat two things: The humidity in Machu Picchu is quite high, it rains often and it is located in the middle of a rain forest. (Okay that was three things). Now guess who likes these conditions a lot? Exactly! Mosquitoes. Especially if you are taking the Inca Trail or climbing one of the two mountains around Machu Picchu (Wayna Picchu/Huayna Picchu or Machu Mountain), bug repellant is a must! I’ve seen some short-sleeved arms dotted with ugly red welts (these gnats are rather biggish). On a more positive note, you really should look out for those beautiful orchids that are everywhere around. 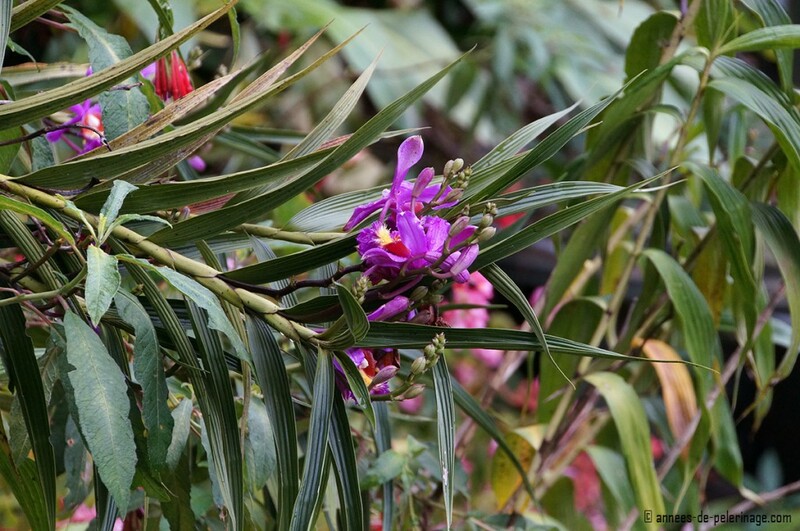 You will need a keen eye though – despite being colorful they are actually hard to spot amidst the dense foliage! I already pointed out that there are no hotels in Machu Picchu. Everyone (except an exalted few who get a reservation for the Sanctuary Lodge) has to stay in Aguas Calientes, the little town some 400 meters below Machu Picchu. There hardly is any space down at the bottom of the valley and so everything is really narrow and packed. Now those 2.500 people visiting each day have to stay and eat somewhere. If you ask me, it really is one of the worst towns in the world. There are tourists everywhere you look, everything is crowded as hell, and every inch is covered with souvenir shops and the like. That’s why I urge you to read my guide to the best hotels in Aguas Calientes. Now I showed you a couple of very unpleasant pictures. Nonetheless, I hope I didn’t convince you to stay away from Machu Picchu. Then you somehow missed the point. Machu Picchu is glorious. It is worth every single Dollar you spend getting there (and it will be quite a few). I stayed 3 full days in Machu Picchu at the very end of May find my complete itinerary for Peru here). Those three days all started out with fog, one day was rainy and the other two had pleasant sunshine later in the afternoon. In a way I loved how things turned out – it gave me the opportunity to experience the ancient ruins in all its many facets. I saw, however, many travelers only staying one day, or worse, only a morning. This could turn out to be disastrous. I also invite you to read Mark Adam’s classic book Turn Right at Machu Picchu: Rediscovering the Lost City One Step at a Time for a different kind of perspective. Mine is not the only opinion and the book is very fun to read! Last hint: Even if it does rain, try to appreciate the ruins as they are. 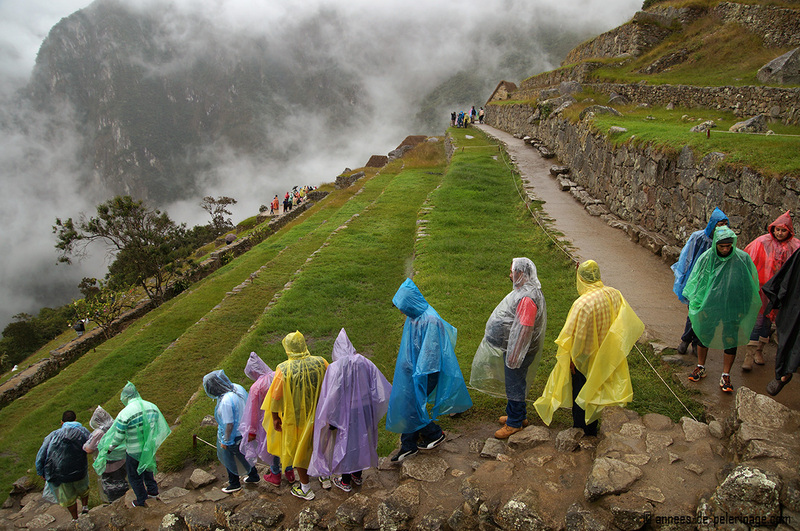 In my opinion, Machu Picchu can be beautiful even in bad weather – it’s just a different view. Hope you liked my different view on Machu Picchu. 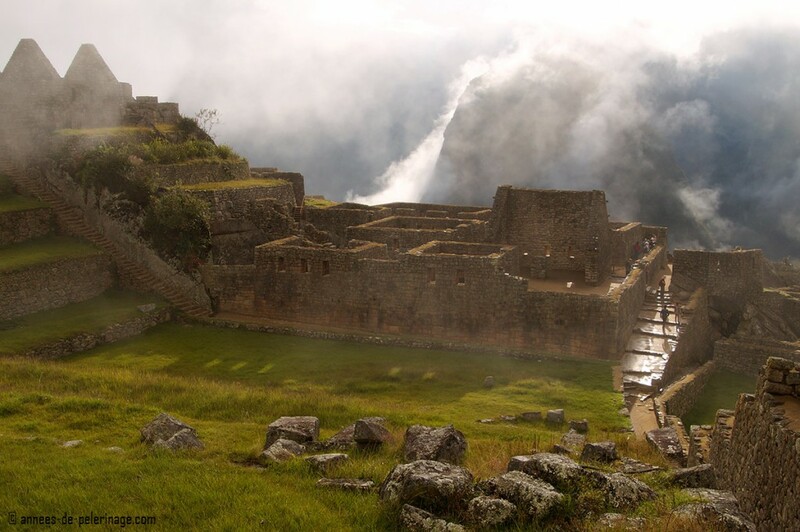 Have you been to the famous Inca ruins yet? What were your experiences? Share your views in the comments below! wow, that is indeed the raw truth. I understand correctly you’ve stayed 2 full days in MP? That is quite a good tip, first day for seeing everything, 2nd day for taking pictures and appreciating the place. 2 Full days and a half day, yap! That’s the way I travel and that’s the way I think vacations make the most sense. I hate changings quarters too much and I also hate spending too much time on transfers. Plus Machu Picchu really is, despite some bad experiences, still a place that really does deliver on all that mythmaking! Visiting Machu Picchu is a dream of mine, but I am worries that the crowds would make it an unpleasant experience. Weather doesn’t bother me but crowds do. I’ll have to go later in the day. Thanks for sharing! don’t be afraid of the crowd. Machu Picchu is a huge place and there are only 2.500 people per day. Compare that to say Disneyland or the Louvre in Paris and you will almost feel its empty. No, you have to go earlier than anyone/most people. Great article! Totally agree with 99% of this (except the Aguas Calientes part- we loved the town!). We went in October and actually got quite lucky with the weather. We were initially choked when we realized we missed sunrise, but then once we got to the site and saw how foggy it was we were glad we didn’t get up and hike all the way to the top! It was definitely overcast for a few hours in the morning, but the sun came out all afternoon and it was so amazing! Thanks for being so honest! I really want to see this place but I might think about it again. I hope I did not scare you. Machu Picchu is great, truly great. And you should definitely go. But as you pointed out, it is sometimes important to show the other side of the coin as well, and that’s what I tried here. I’ve been to Machu Picchu 3 times in my life… I have to say the 3 times were amazing…!!! The second one I did the 4 day Inka Trail hike and we did get to see the sunrise just when we were arriving. The other times the weather was pretty good, although there was heavy rain in the morning on the third time but we did come back in the afternoon and the sun was shining in all its splendor. I think this is like most places in the world, even if you think you’ve picked the perfect time of the year you can always come across some unexpected weather, after all a place as green as this needs its fair share of water to stay that pretty anyways…!!! And with all its hustling and bustling I still liked the town of Aguas Calientes. I think the best thing to do is arrive in the morning, go visit the park in the afternoon and stay as late as it is closing, that’s when you will have the place almost all for yourself, then go back the next day in the morning to climb the Huayna Picchu and go back to Cuzco that afternoon. Don’t even consider doing MP on a one day trip… this is a trip of a lifetime and just going for a quick day trip at the peak of tourist rush hour is a complete waste….!!! Ela, I could not agree more and thank you so much for taking the time to comment. Quite frankly I really don’t understand these day tourists no matter where you go. I just love getting really intimate with a place – and that won’t happen in 24 hours. Very good article. One thing to point out, though, about the often-cited 2,500 visitor limit… Peru blew past that in 2011 and never looked back. 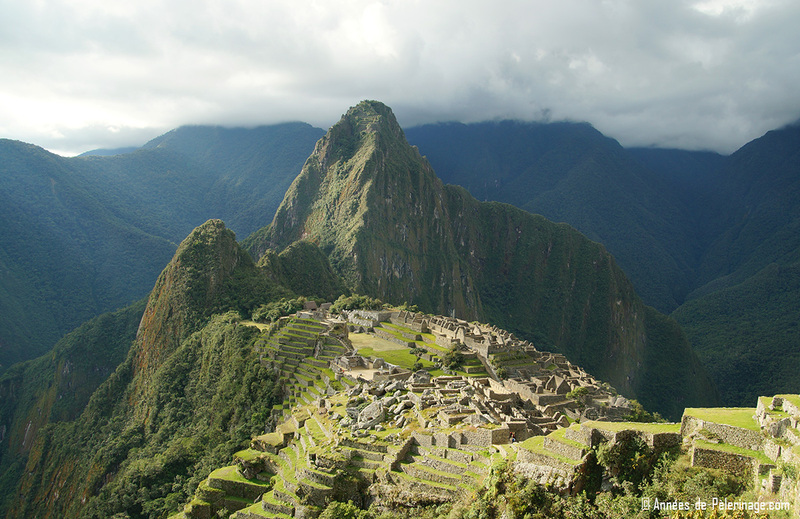 UNESCO is totally on board, as long as Peru stays on course with the 2015-2019 Machu Picchu Master Plan. thank you for pointing that out! I didn’t know (and doesn’t say so on the offical website). In my opinion Machu Picchu would greatly profit from a cable car to the top (that dangerous road is just an ugly mark on the landscape). That being said: the limit is, as far as I know still active. There are, however, those 200 additional people per day entering through the inca trail. With 1,079,426 visitors in 2015 that’s about “just” 250 more visitors per day. So more or less within the limit. The Machu Picchu Park director Fernando Astete told APTN (Associated Press’ TV feed) in October that the site now gets 4,000 daily visitors (that’s during the high season, not every day of the year). Astete also says now that the 2500 limit was never a firm agreement but rather a recommendation…. (a recommendation that was held over Peru’s head like the sword of Damocles if Peru didn’t get its act together, which it is finally doing now…) The aim with the changes to the tourist infrastructure, and plans to spread out the flow of visitors across expanded routes, is to get the number up around 2 million visitors per year. This has been a long time in coming. Hopefully, with Peru actually adhering to UNESCO’s recommendations, the visitor experience will improve. But the days of freely wandering the ruins in contemplative peace are unfortunately numbered… That’s the price we pay for promoting Machu Picchu to the globe as a Wonder of the World. thank you again for sharing these numbers. I am “only” a travel blogger. While I try to research as thoroughly as possible, some details always escape. In this case I was not aware of any changes for the future, or rather did not look for it. I think MP has the chance of greatly profiting from any changes and I do believe that certain areas would greatly profit from being off limits to certain groups of visitors. I visited MP back in 2006, during the end of November. We did a weeklong tour of Cusco, MP, the Sacred Valley, and the surrounding areas. At MP, it rained a bit in the morning, but it ended quick and the fog made for glorious photos! I do not remember being bothered by mosquitos and the crowd was not bad. The bus ride up from Aguas Calientes was very nerve wracking.. And it’s definitely not a place you’d want to visit if you are afraid of heights or have vertigo as your nausea limits WILL be tested! All in all, I loved it there and am waiting for the chance to go back to experience it all again! That sounds like a very fun itinerary! I also recommend touring the Sacred Valley, Cusco, etc. There is so much more about Peru than just Machu Picchu. There is deserts, Amazon Rain Forest and of course beautiful beaches. I think the Mosquitoes are a seasonal thing, so it might explain why you didn’t see any. This is the unfortunate truth about most of the best places all over the world. Angkor Wat is the same. Halong Bay is the same. Pura Tanah Lot (Bali) is the same. Niagara Falls is the same. The list goes on and on. I still go to these places and I still marvel at how amazing they are but the crowds do diminish the experience. I accepted this a long time ago. I spend a lot of my time exploring well off the beaten path as well as visiting the big sights in a country. Good article but I wish you would have included more about the option of hiking the Inca Trail. I did it in September 2014 and I am so glad I opted to do the full hike. It did rain for two of the three days, which was hard, but the hike was still totally worth it. There are a lot of beautiful ruins along the hike that you can’t see otherwise. On the third morning you get up early and head to the sun gate. If you go quickly you can get there before the majority of the hikers and before the day tourists come. This is the best way to see the site. We lucked out and got to see a beautiful sunrise, which was a very special treat after two days of rain. The only thing I wish I had done differently was scheduling a second day to see MP. We were tired by the time we got down to the ruins so didn’t stay long. It would have been better to stay in Agua Calientes that night and then go back for another look the next day. Anyway, I just wanted to show another option for anybody wanting to see the site when it isn’t as busy and for seeing more ruins along the way. I’d say it’s a once in a lifetime experience, but honestly, I could see myself doing it again! 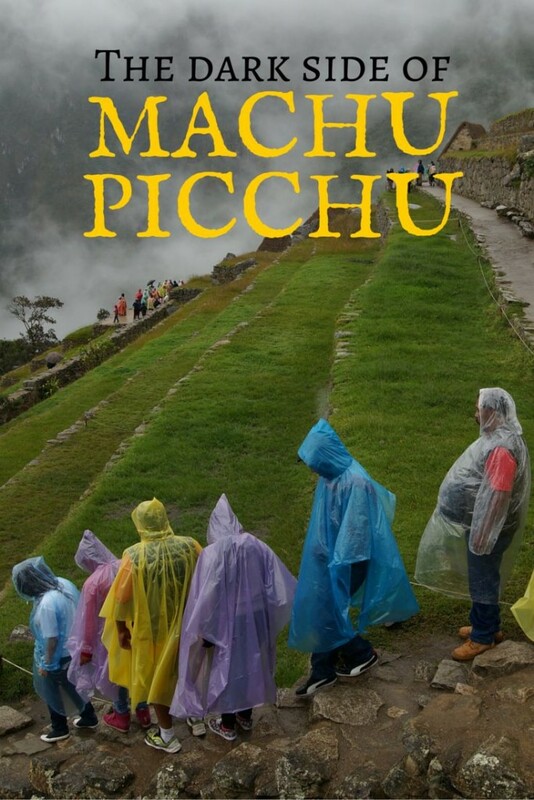 I did write a couple of other articles on Machu Picchu. This is why I didn’t really talk a lot abbout the Camino Inca here. But maybe I should add it. And I agree – staying a full relaxed day at Machu Picchu is so worth it. Two days are, obviously a money issue, since the entrance tickets aren’t exactly cheap, and neither are accomodations in Aguas Calientes. (I stayed 3 days tho). Machu Picchu wasnt discovered by Binghan it was discover for Agustín Lizárraga!!!! Still – thank you for pointing it out. I did change the wording slightly. Whether Agustín Lizárraga really did discover Machu Picchu…well..who can really say? Two facts remain: Hiram Bingham did make it popular and there were people living in the ruins when he rediscovered it. Do not get me wrong: I came to greatly appreciate the Peruvian people, their country and their national pride. I got the impression, however, that the discovery through Agustín Lizárraga is just another myth – like Hiram Bingham. I have to say, it was a treat to read an article that wasn’t full of sunny photos! My husband & I found super cheap, can’t miss it airfare (seriously, less than $400 per person roundtrip) with the only catch being we had to book the tickets for Feb. We are not averse to traveling in rough weather (we went to Iceland in Dec.), but it is nice to see pictures of what MP will most certainly be like for us. I have to admit, it is quite nice to travel without the burden of high hopes!! well, personally speaking I found Machu Picchu to be breath-taking even in rain. It is different for sure, but still stuning. I think that tells a lot about it. I think Wayna Picchu is closed during that time tho. Hey! I’m going to Machu Picchu in about at week… how did the weather turn out for you in February? Thanks for the great post! I am planning a guided trip in July and the only thing I’m not sure of if the altitude sickness…how did you prepare? If you are planing to go on to Cusco or lake Titicaca, you will have to get accustomed slowly. I dont do well with altitude anywhere for a couple days. we landed in Cusco and spent a few days there and made our way on foot without any guide, carried all our food and shelter. A few days in Cusco was the trick, it’s the same (ish) alt as MP so when we arrived after days in the mountains and jungle alone it was easy to enjoy the site because we weren’t sucking wind though our asses like 60% of the people there. I don’t agree with this article much, and if you’re not experienced with altitudes you wont know and nobody will be able to tell you how you’ll feel. come day 3 in Cusco, you’ll have a good idea. pills dont work either so save your money. that sounds awesome! One whole month is a lot to explore Cusco and its surroundings. To start with: I bet your host family will be able to give you many more insider tips than I will ever able to pass on. 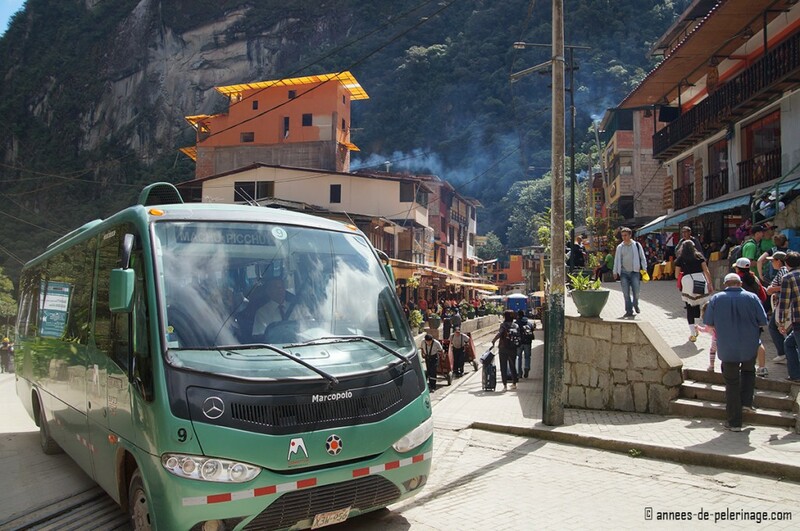 The cheapest (and most inconvenient) way to reach Machu Picchu will be by bus and then a short walk to Aguas Calientes, where you would have to sleep one night. The entrance tickets will still be expensive. Wayna Picchu is just 10 $ on top – can’t book it alone, though. The Inca Trail is very touristc and too expensive. Wouldn’t recommend that. A faster (and more convenient way) would probably be to take the regular train (not the vista dome!). As for hiking – there are so many beautiful hikes and trails around Cusco and those are for free. The whole area arround Cusco is full of ancient Inca Ruins (Tipon, Maras, etc) as well. Thank you for the great tips on MP. I am traveling there the second week of March for the first time. Do you think I should buy tickets in advance (now) for MP or will I be ok in terms of getting to go up when I want? Also, what should I expect the temperature to be like in March? I am almost 60 and prefer not to do too much hiking to the top. I am taking my two adult children and we are staying Saturday through Monday. What do you recommend we do in that amount of time? Any additional tips would be appreciated. you should absolutly get your tickets in advance, meaning now. Waiting until the day could turn out desasterous – meaning no tickets left. As for temperatures – they are more or less the same throughout the year. So warm, but not too hot. Do be prepared for rain though. And also: Machu Picchu without hiking will not be possible. Even if you are still taking the standard trail, it will go up and down. As for things to do: Well spend one day in Machu Picchu and the remainder of the time in Aguas Calientes. There are hot springs to visit, a big market, a museum and maybe on Sunday a fiesta on the market place. if your kids like to go hiking, they might want to get tickets for an additional day as well – though it can be done in one day. Great article! I went one December about 6 years ago and it rained the whole time – luckily we didn’t have the fog. Plus, judging by these photos, I don’t think there were quite as many tourists asthere are now which would make it a different experience. If I was to do it again I would like to stay overnight after the trek and visit again. By the end of a 4-day hike I was so exhausted I didn’t really want to explore. Having said that I did LOVE the hike – so much so that in some ways I enjoyed it more than Machu Picchu itself! thank you for your extensive comment. It is much appreciated. As I already pointed out in the article itself, Machu Picchu has many facets and this article obviously just highlights one that is not so frequently covered. I am aware that you can get last minute tickets. I am also aware that on my last visit the two girls waiting in the queue befor me, realized that no tickets were available in front of the gates of MP and they sent her away. As for cable cars – having been born in the Bavarian Alps I find them the most natural, non invasive, least dangerous, least polutant solution and most of all, not leaving such an ugly mark on the beautiful landscape. But ofc everyone is entiteled to his or her opinion. Oh an one more thing. I am not sure where you get the information that there were toiletts WITHIN Machu Picchu. I certainly didn’t find any and no information on their location either. I went there between Christmas and new years and the weather was wonderful and the crowds were not to bad. No problems getting hotels or tickets anywhere. Not to mention, Cusco is a blast on new years eve! No one spoke English, just local travelers visiting family for the holiday mostly. A light rain storm came in while we were at machu picchu and left double rainbows over the ruins, absolutely amazing. I believe that every trip has it’s ups and down, but true travelers don’t expect perfection and nor do they travel to look for it. As travelelrs we should know how priviliged we are to be doing so in the first place and realize that any complaint is a “First World Problem”. I hiked in Inca Trail, during rainy season, and had an absolutely life changing experience. I would highly recommend it to anyone looking for an adventure and I, myself, would do it again in a heartbeat. Such a negative review of what is considered by many to be the most magnificent place on earth!! It will have rain and it will have fog, and yes we had both, but this did not take away from the magical, mythical, ethereal experience we shared; in fact it only strengthened the drama unfolding in front of us. Tourists need to be realistic, well versed in their expectations and take it for what it is. Yes there are going to be other tourists there, aren’t you one? My advice is stop waiting for that perfect moment to photograph for Instagram, look with your eyes, walk with your feet and truly immerse yourself in what is around you. I’m also concerned about the misleading comments regarding Aguas Caliente…this really is a charming ski-resort-like town, quaint and buzzing with energy, with a background soundtrack of the ferocious river beating its way past – what’s there not to like? I think if this experience does not leave you breathless and inspired then no where ever will. I really appreciate your comment. However, I do want to take the opportunity to clear things up. Nowhere did I write that Machu Picchu isn’t beautiful! Much like you said, I did mention a couple of times that Machu Picchu will be beautiful even in rain and that just breathing in the amazing Inca ruins is well worth every dime you spent. But just as you said: as a tourist you need to stay realistic and that was the aim of this article. If you somehow misunderstood my, I do apologize. As for Aguas Calientes. I’m sure a lot of people will love AG. As someone who has been traveling for more than 3 decades, I see things a bit differently. The town exists because tourists need a place to stay and spend money. The market right at the entrance, the many bars and restaurant along the train tracks with multilingual menus selling spaghetti and hamburgers, the many crappy hotels..it all screams tourist trap to me. Then there are those very tourists milling around – guide book in one hand, etc. It is nothing I want to see when I am on holidays. But i am an introvert so I guess this might explain it. Def your a terrible tourist person ! How you dare to say such a thing about a magnificent and wonderful city? Keep your bad comments for yourself. while I respect any feedback, I would love to hear from you, in your own words where I didn’t say magnificent was magnficient. I’m here, right now, but decided not to feed the machine. Compared to other ‘Wonders’ in the world, it is overpriced. $65 entrance! Are you kidding me! The train is $80 for gringos, 4/S for locals. No. I refuse to visit MP because it has become the most expensive ruin to visit on the planet and it’s not even that old! Also, I don’t have much respect for a civilisation that built so high up, so far away from the wonderful valley, with that beautiful river. Why did they do that? Was it to be ‘closer to the Gods’? At the time they built, they were not at risk of invasion. I just don’t get MP and I certainly do not understand why the place charges so much. Inca ego? Just want to add – I visited for two days in June 2016. There was fog & rain, but both appeared only after 10 AM. I HIGHLY recommend hitting the spots you most care about between 7-9 AM (including hiking either side mountains). There were absolutely zero mosquitos so I would say people do not need to worry about malaria/Zika unless they are young or old. The Montaña is the other hiking mountain at Machu Picchu. It’s a shame it’s not mentioned – the photos from that trail are certainly superior; although the hike is actually harder and no less dangerous. Still, it was by and far the highlight of our trip. It’s an interesting visit! But so much else in Peru is simpler and cheaper to access. We enjoyed MP but the Sacred Valley was just as good, and MP is definately a big income earner for Peru. Howvere, it is a place most people will visit knly once and the operators know that so they gouge ever dollar. Our Uluru is the same, beautiful and overpriced. Again, it is worth extending the value of a trip to MP by spending a week in the Sacred Valley or Cusco and using local transport to visit Marais, the salt mines, Pisac and especially Ollantaytambo. Do the trail if your gonna go. See the sunrise from the sun gate. It forms a perfect shadow over the “city”. Get out of the place by about 10 am when the train arrives and then chill out in AC. People: get a second opinion. 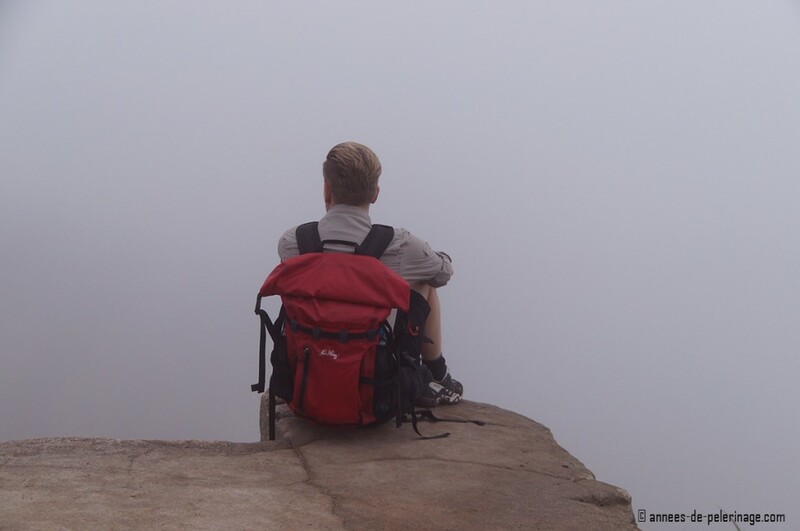 Do I understand this blogger spent three days in Machu-Picchu?…….and now he’s an expert on it? He had weather problems because he went in May. What a downer of an article! What did he expect!…..Machu-Picchu is one of the top Wonders of the World! Naturally, the whole world wants to have the Machu- Picchu experience. Norman says: “don’t go to Machu-Picchu…….but be sure not to miss it.” Maybe he loves it so much he’s being selfish about it. I love Machu-Picchu too and because I am Peruvian I want people to see this Marvel of the World……but I do realize tourist traffic can erode this beautiful spot. Famous travel writer Arthur Frommer was once asked: “Of all the places in the world, which was the most beautiful in your opinion?” His answer was……and I quote: “Hands down…..Machu-Picchu. It is the only place in the world where geographical beauty and man-made feat come together in such a glorious way.” So, world travelers……take the bad with the good, it’s worth the inconvenience and frustration to see what an awesome place tbe Incas selected to show what great architects they were. If the Peruvian Ministry of Culture decided to limit the daily visitors to 2,000…..a lot of tourists would complain and would give up on ever visiting this awesome Wonder of the World. So they’re damned if they do and damned if they don’t. Norman is full of ideas about how he would re-invent Machu-Picchu…..but does he know better than Peru’s Ministry of Culture? When you people visit Peru, check out some museums and see for yourself what a great job the Ministerio de la Cultura does. Just one example…..check out the “Royal Tombs of Sipan Museum”….wow! World class! I have news for you world travelers…….there are thousands of people at the Colosseum, thousands of people at the Great Wall of China and other Wonders of the World, so no one should expect to see Machu-Picchu in an intimate setting. Just see it while you can……before they close it to the public entirely. I value any opinion, so I truly thank you for adding yours, especially since you are a Peruvian. That being said, I don’t like it so much when people criticise me without reading an article thoroughly. First of all, the only reason I wrote this article in the first place, was showing travelers another side of Machu Picchu. They are spending thousands of Dollars to get there, hunting that one perfect picture with no tourist in sight. Just like you actually said, expectations and the real differ. Machu Picchu is a World Wonder and more than worth to see. I wrote this multiple times – here and in other articles I linked from this one. You know, being honest with you, if you want tourists to come to your country, you should be more open to other opinions and read them more carefully. I never complained about the weather and neither did I complain about the many tourists, I just stated a fact. and last but not least. Peru’s Ministry of Culture has still a lot to learn. To be quite frank with you, only the private museums like (Larco Museum in Lima) hold up to international standards. The Ministry did a lot of mistakes in the past (which the UNESCO did criticise). Obviously, money is a big issue. As of now 2,500 standard tickets are sold. another 500 for the Inca trail, and since 2016 there is the afternoon ticket. So on a day in the high season maybe 4000 or more people trample around the (actually quite unstable) paths, paint graffiti on the walls, climb the walls and so. The damage is already visible. Sure they are reconstructing further parts of the ruins – but if that is truly converting it into a more authentic state remains debatable. I enjoyed reading this post!! I think every famous spot has a dark side to it. :P It’s hard to find a place to yourself these days with instagram around. I guess I didn’t realize so many people photoshopped people out or waited hours on end for that one perfect shot. And from reading about the fog and rain.. I only heard about it but didn’t experience it at all. We must have lucked out. We were at the turn of the season, and they told us it’s likely we’ll get poured on.. but the entire hike was really sunny. I really enjoyed reading this article because I’ve never really considered the ‘other’ side of Machu. I guess you always look at social media posts where everyone posts the positive side and think that that’s all there is to a place! SO true! And Craig also dropped and broke his iPhone, we were only on month two of the 17 month trip. The crowds are unbelievable but we did get there early enough to get some pre – elbowed pictures and the sun came out, for a bit! And to think they are allowing even more people into the ruins now *sigh* There is an afternoon ticket now. Norman, I will be in Peru on November 7-14, but I’m concerned about the weather. I’m visiting Machu Picchu on November 10th and I’m anticipating rain with thunderstorms. Any suggestions? don’t be all too worried. November sees an average of 13 days of rain…that leaves 17 sunny days with 21 degrees celsius and more ;-) Also, it’s not like there is a monsoon or so. November has 78,6 mm of precipitation, so the rain will, in most cases, not like a deluge but more like a drizzle. November is one of the warmest months in Peru, tho. That being said, i’d definitely pack in some rain gear. I was lucky to visit Machu Picchu on a clear, sunny day this past May and it was breathtaking. However, this was just one part of an amazing 3-week journey through Peru led by a brilliant guide. Oda Seedhouse is an anthropologist and linguist who speaks fluent Spanish and Quechua. Oda and her husband Armando, a wonderful artist, own a guesthouse, Andean Spirit Lodge (formerly known as Yoga Limatambo Guesthouse). This was my trip of a lifetime which I wouldn’t have missed for the world! so glad you were lucky with the weather. May is indeed a lovely month to visit Peru and having a truly knowledgeable guide along, certainly a wonderful asset. Peru is so versatile and I can well imagine, why it was the trip of a lifetime for you! Thank you, Jen! But absolutely do go! Great article- thank you for your insight, this is very beneficial and will help us make the most of our trip in May. May is a great month to visit Peru! I am sure you will enjoy it as much as I did. There is nothing I appreciate more than an honest traveler!!! Thank you for all the info!!! This May I´ll be there and this help me do my itinerary!! Thank you Betzabe for your kind words. I am sure you will be able to enjoy Peru. It is a great, great country! Hi Norman, Thanks for taking the time to respond to people. I was wondering if it is worth getting two day tickets as we’d like to do Wayna and Huchuy. We are quite young (30ish) so looks like we could do all three in one day though, probably starting first thing from Inca trail. Would save us some time on our trip and a bit of money but I wouldn’t want to miss bits? My second question is how do you book the Inca trail? There is very little information on this and whether the 2,3 5 day trek makes most sense. You can climb them both and it’s quite worthwhile. The other mountain is Machu Mountain (or Montana). If you plan to do the Inca Trail, I wouldn’t climb both large mountains within Machu Picchu. It feels like a bit of an overdose to me. It is certainly a different angle, but at the end of the day still Machu Picchu from above. 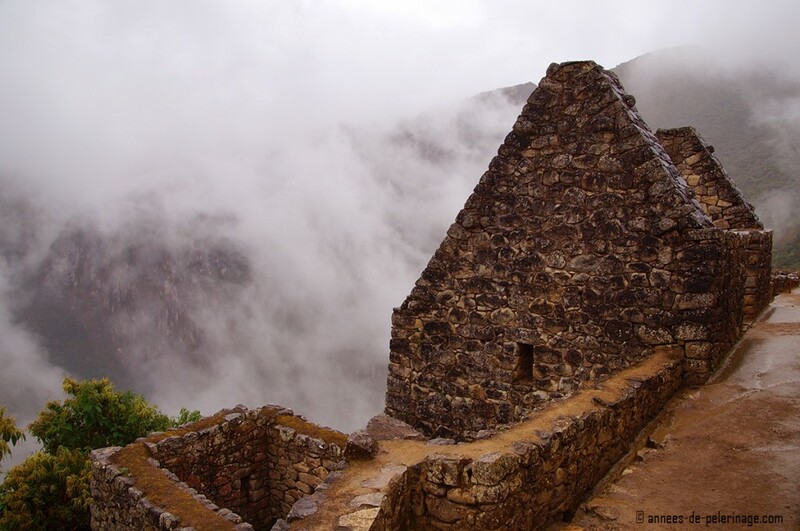 You have to book the Inca Trail through local accredited tour agency. As for what makes most sense – hard to tell. The longer the hike, the more ruins you will see. Please note that 1 day is always reserved for MP itself. So the 2 day trail is 1 day trail and 1 day MP. Hi Norman! I think your article is very unfair, I respect your point of view in that moment and sorry for your bad time! but I visited Machu Picchu and was amazing, it was a beautiful sunny day and I got beautiful photos! Many people and friends had a great time in Cuzco because we checked the weather before go. In my opinion, it’s good time to travel to Cuzco since end of June (like I did) until November. On December until April rain a lot so it’s no recommended. I didn’t see any crowds or mosquitoes. In conclusion, I think you were very unlucky or maybe just karma! ? But there is no denying, that all these are a part of Machu Picchu, just like it is very expensive, there is no toilet within the ruins and no snack back either. I’m sorry but the only thing I have to say here is that all of these may happen in the rainy season. Which is from January to April. So you should start with that info before telling all that series of recommendations. I have been to Machu Picchu many times. None have been as bad as you describe. The site is very spiritual and the changing weather conditions add to its spirituality. I recommended the late afternoon as the best time to see the ruins. Take the last bus back and you will have at least 2 hours with few other visitors. Norman I think you should stay at home and stay there to feel safe and avoid “iglú” places. I’ve been to Macchu Picchu 5 times between 1984 and 2017. I won’t return. It’s a zoo, though if you go for the last few hours, as recommended here, you can still catch some of the beauty. Sure, go see it, but then go see equally impressive ruins in the north, such as Marcahuamachuco, Kuelap and the Pyramids of Moche, in Trujillo. Very rewarding and no crowd. This was a great read! We will be visiting next week and understand that the weather is supposed to be awful this time of year. Good to know that afternoon is ideal to visit. Also it encouraged us not to stay in Aguas Calientes! By the comments made by the wrtier and others, I am so glad that I went there in 1996. After the vary early flight from Lima to Cuzco I had a day to acclimatise before going by train to Machu Picchu on a glorious sunny but very hot day on 1st October. The train trip was good, the bus ride up the mountain scarey for some and there were thousands at the site that day. It was so hot and I needed more water than I had with me. The guide was good but I found the site too crowded for my liking. In the afternoon I got the bus back to Agua Callientes where I had a room booked in a small hotel right on the railway platform. I liked Agua Callientes and it wasn’t overly crowded back then. After dinner I heard music coming from the plaza and went to investigate. People were celebrating 55 years since the establishment of the Machu Pichu government district. There was a good band playing but I nearly cracked up when they started playing “Jingle Bells”, in October! Whether they knew what the song actually was, or whether it was just a nice catchy tune to play, I have no idea. The next morning I caught the 8.00 a.m local bus back up the mountain. The only people there were the ones who stayed in the lodge at Machu Pichu, the crowds from Cuzco had not yet arrived. I had a wonderful peaceful time until about 11.a.m when the crowds trailed in. I could amble around the site, find quiet places to sit when I wrote some poetry and post cards and just drank in the magnificent scenery. I got the bus back down the mountain in time to catch the returning train to Cuzco, one of the most memorable days of my many travels. Just re-reading my travel diary brings it all back to me. And after reading the article above and the advice it contains, I am glad I was there 21 years ago. Try going in September/October, you might have more luck with the weather. After Machu Pichu I had two more full days in Cuzco which included a day trip to Pisac and Olyantantanbo, just magnificent. On the third day I set out on the train trip across the altiplano to Puno and thence to La Paz. La Paz was another story altogether. A total trip of 10 days put together by a specialist South American travel company, not a hitch in any arrangements. A typical gringo post! Hahaha You forgot two more advice… don’t forget yours Safari clothes and take care of the bad monkeys! Hahaha Thats ridiculous! the worst post ever! Hi Norman, I really enjoyed reading this post! I stumbled across your blog about 9 months ago, and have revised while I’ve been looking for more Machu Picchu/Inca Trail info. I’m hiking the trail in just over 3 weeks. I’m quite nervous about my fitness but I’m raising money in memory of my Dad who I recently lost – therefore hoping that the reason behind it will spur me on and keep me going! I don’t consider myself a traveler as such – I’ve been to various places but not enough yet! However, I do appreciate the more down to earth view of things. I prefer to immerse myself in local culture as much as possible. When we were doing charity work in Cambodia, I visited Angkor Wat and was astounded by the amount of people there. I don’t feel it ruined my experience – it would just have been nice to know that there would be people shoving me out of the way for the best spot to see the sunrise. After that it was wonderful, and I appreciated just being there. Tourists will now always be an issue, so I make sure to be grateful for the opportunity regardless! I saw that you’d said you’d stop the Inca Trail/Camino Inca if you could. Can I ask why that is? I’m being realistic about what to expect at Machu Picchu and your post has helped that. Especially as I’m going in May! well the Inca trail is a very touristy affair. It’s nice, and you will see a couple of additional (and quite lovely) ruins. BUT, there are soooo many other hikes around Peru and I’d save my time and money for these. Machu Picchu is just one very famous ruin and the Camino Inka sort of overpriced. But at the end of the day it’s still quite enjoyable. This article is so stupid, you goin to visit a ruin with so much history and you only complains to the weather, ohh excuse me, the peruvian and inca people must be construct a giant roof over us to im not weat in the rain, if you want a comfortible place to visit go disneyland or a five stars hotel, its riskie? of course idiot, did ou know the history of this place and why this people made in this place with dificult acces? no doubt another european dumb visiting places who dont understand. go to Dubái dude stay in the burj al arab and be happy. before you complain and insult, please do me the favor and read the article to the end. Otherwise people will get the impression Peruvians are “stupid” and “dumb” – and not the Europeans, eh? And I tell you a little secret: Unlike me, there are tourists who care about rain and discomfort, some of them are even elderly and just can’t cope with such situations any longer. They are going on vacations, spend a looot of money and really don’t want to be disappointed. So please, stop your baseless predjudices. Thank you! I completely disagree with this article. I just went there and it was just AMAZING. Actually we didn’t had fog at all, but if would’ve it I don’t see how that is a problem, it is just part of the experience. People shouldn’t be discouraged of visiting Machu Pichu for this reasons. About Aguas Calientes… you don’t need to stay here overnight, in fact you can just take the train in the morning from Cusco and be back by night, if this is the station from where people depart for last time before MP then how can you expect not to see that much of tourists? It’s not dark as you mentioned it, it is just an adventure. Can you imagine going to the jungle and not expecting mosquitoes?, then don’t go, because that is never gonna happen…the same here. And if everything was regular with nothing different probably wouldn’t be called Wonder of the World. I guess we have different perspectives of it and your opinion is ok but is just your point of view, I mean no offense but next time visiting another country keep it real, try not to leave the city where you can have air conditioning, sidewalks, no bugs, and you can easily find a roof in case of heavy rain. I agree Kuelap is amazing, though Pisac and Tipon where my personal favorites. Go end of June or July. Book yourself in the MP hotel up there, so you can watch the sunset when all tourists have left the park and have the park to yourself in the early morning bf the mass of tourists arrive. Hire a private tour guide so he can walk you through the park and waina picchu. Just wanted to say, I can’t believe some of the negative comments on your blog. Obviously, the authors never read any of your other articles. I think your advice was spot on. We just got back from MP and had an amazing experience. Rain was predicted for the 2 days we were there, but we were fortunate enough that it didn’t materialize. You are right, afternoon is the time to be there. Fewer people and a wonderful atmosphere. We came back the next morning and climbed Wayna Picchu. It was a perfect experience. I must say, Aguas Calientes did surprise me, I didn’t expect it to be so “honky tonk” to use an American expression. But I guess it is to be expected, with so many people in such a contained area. We were fortunate to stay at the Inkaterra MP Pueblo Hotel which was delightful. We actually researched the best time of year to have the fewest crowds. September/October seemed to be the most common suggestion. I guess we lucked out with the weather and the crowds. For your readers, I’m 68 years old and had no difficulty hiking Wayna other than some huffing and puffing at times. I’m a walker, but not a hiker, so it is very doable. I was glad to see they reversed the path so now you go up the “death stairs” not down! Thanks for all your excellent advice. thank you for your kind words and thank you for sharing your experiences. Didn’t know they reversed the path…which is probably a good idea! How many times have you gone to Machu Picchu? Stop spreading fake news! I have personally visited MP multiple times years apart and I disagree with almost all of your comments. The weather largely depends on what time of the year you visit and if you know when to go you wont have to deal with the fog issues you mentioned. The Sun Gate was never a problem and I and many other people don’t appreciate you calling it the Fog Gate. This is such a stupid article and I hope people reading take it with a grain of salt because Machu Picchu is such an amazing place and it upsets me that you would try to show this beautiful destination in such a negative light. If you thought Aguas Calientes was bad then I can only imagine what your opinion would have been if you visited anytime before 2006 when it was literally a shanty town with half built hotels. while I appreciate your comment, I would equally appreciate if you’d read my whole article. Of course, there will be no rain in Machu Picchu if you visit during the best time of the year, and if you’re smart about it there will be no fog at the gate of the sun either. I never said anything else but that MP is a great place and yet half of the comments here say I’d hate it and tried to dissuade people from visiting. Which is utter rubbish? While there are other, equally beautiful ruins, MP is beyond amazing and one of the few World Wonders that delivers on its promise. But it’s not all icecream and peaches either…. Interesting read, but far too many links to your other blog pieces throughout – almost every paragraph seems to be a plug for a different article. I get you’re trying to drive traffic to other areas of the site, but it’s a bit much and makes the writing clunky at times. Still, kudos for showing the less glamorous side of this wonder of the world; there aren’t enough people showing it – too preoccupied with only sharing the prettiest of pictures because that’s the superficial state of social media. thank you for your feedback. I did write a lot of content about my stays in Peru, so naturally, there are also a lot of links. I guess it is “clunky” for those who just want to read this article, but I hope the links will help people further plan their trip. thank you and glad I was able to help! Before there were thousands of tourists spoiling the experience. I went during the dry season this experienced no rain and the atmosphere was beautiful and clear. Think I’ve already done my Machu Pichu trip for this lifetime. Thanks for your comments and persuading me not to waste the time, money and effort to go back again. What terrible blog!!! a lot negative things about Machu Picchu ;( what pity!!! I think you can write a lot pity things aorund the wonders of the world. what is the next??? Well…a good next would be if you’d start reading the article before commenting. Besides, I find it a very worrying development when people actually believe some things just have one side.